Being one of the renowned manufacturers, suppliers and exporters of umbrella, we offer an extensive range of Cantilever Umbrella. Our range is powder coated with aluminium frame to offer rust resistant range. These are fabricated using superior quality material along with technical specification to offer flawless range. These are widely appreciated fore their colour combination, light and vibrant colours and artistic looks. These glasses need several beads and are in high demand. Our glasses need strong framing as well as wide beadings. Reckoned as one of the prominent manufacturer, supplier and exporter of umbrella, we offer wide variety in accordance to the customer’s demands. 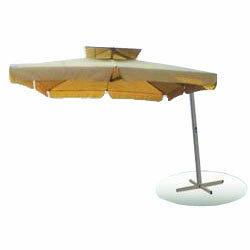 These umbrellas are known for their style and comfort.